Happy weekend to everyone! I was fighting some cold and trying to hang in there with the lectures but I am glad that I feel much better. This weekend we have visitors at some so I will try my best to sneak in a few posts because I got such pretty things to show you. I can't wait. Laura Mercier released a color and a body & bath collection for holidays as usual. I fell in love with the very wearable shade selection in Glam To Go Eye & Lip Travel Case which comes in a super practical and chic packaging. It is really the definition of grab & go. The first product I have tried from Laura Mercier years ago was their hand cream with Crème de Pistache scent. It is what opened the doors to this brand for me. I still always have a full size of this one in my office and at home as a mood lifter which provides great hand care. This year there are four mini-sized hand & body creams in Little Indulgence Hand Cream Set. My thoughts about both of the sets are right after the jump. I have checked Laura Mercier Glam To Go Cheek, Eye & Lip Travel Case at the counter and I was amazed with how beautifully all of the shades performed. Big palettes usually have a shade or two which is either powdery or dry but Glam To Go manages to combine good quality & practical packaging all at once. Eye Color pans are rather tiny, with 0.6 g of product in each but since I rarely ever make a dent, that is fine. My brush can nicely pick up the shades as the surface is large enough for small as well as large eye brushes. The packaging is uses space optimally and manages to fit two cheeks, four eye and a lip product in a compact which would normally have only a few eye products. The exterior has a modern animal print, which look chic and sturdy. My only problem with the packaging is the transparent plastic cover on the eye shadows which doesn't want to stay in place so I worry that it will ruin the cheek part but until now it didn't happen, so probably it is my worry than anything else. Also if you don't hold the compact horizontally and open it, the lip gloss may fall down so I have to remember it in the morning when I am rushing. Other than that thumbs up for the packaging in all aspects. Coquette: A very light off-white with a pink hue and satin finish. Great for inner corner and under brow highlight. 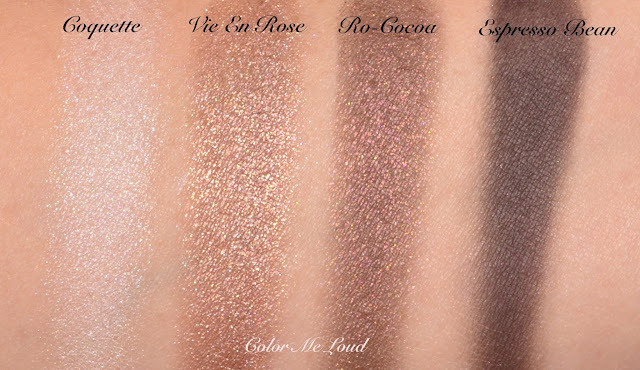 Vie En Rose: A lovely mid-toned taupe with shimmery finish. It is just right for everyday wear, not too shimmery. The golden shimmer is gorgeous but it is not too warm either. Love. Ro-Cocoa: A deep brown with pink shimmer. This one is to die for. I wished this is available as a single color but I don't see that at the offerings, can you? 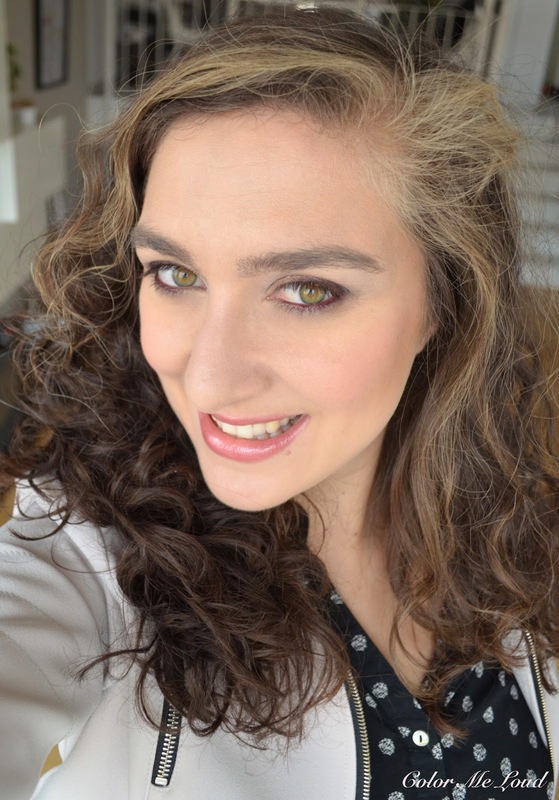 Laura Mercier should definitely make it permanent! Espresso Bean: A very deep cool brown which is a matte perfection. Good for a liner or to deepen the crease and define the outer corner. Here is the eye look using Coquette in inner corner, Vie En Rose all over the lid, Ro-Cocoa on the crease ad outer corner, Espresso Bean to define and smoke it out a little more again on the crease and outer corner. How typical of me to think that "how come this eye look doesn't look nice on the camera as well as it does in real life?" as I was doing the photos and rushing in the morning. Then I went to work and took a look at the rest room just to find out that I was not wearing any mascara!!! Hahah so here I look the base lashes, not because I chose to but because I forgot to apply the mascara *winks*. Do you also forget mascara from time to time? All I can say is that this is not the first time I do that! 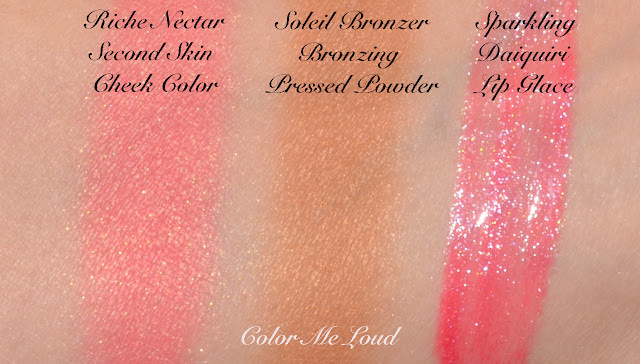 For the Cheeks & Lips Laura Mercier Glam To Go offers Second Skin Cheek Color in Riche Nectar (4.5 g) which I believe is a limited edition shade which comes with this set only. It is a gorgeous pink with gold satin finish. I can see this one working on every skin tone. The only thing with this one is that I observed it fading away rather quickly but since the palette is so easy to take with you, one can retouch it needed. Soleil Bronzer (4.5 g) is the only shade which doesn't work on my skin tone in this palette. It is too warm for my complexion so even when I use it sparingly, it leaves a burned brown look on my cheeks. I wish there was a highlighter or a cooler bronzer instead of this one but it might just be me. Sparkling Daiquiri is my first Lip Glace (2.8 g) since I usually don't wear much lip gloss. I found the formula to be comfortable, not too sticky and long lasting. It gave my lips a nice wearable sheen and didn't look as sparkly as it name nor the swatch. Here is the full look with Riche Nectar on the cheeks and Soleil lightly dusted as bronzer. I am wearing Chanel Khol in Rouge Noir (reviewed here) since the day I got it hence here is have it around my eyes as well. 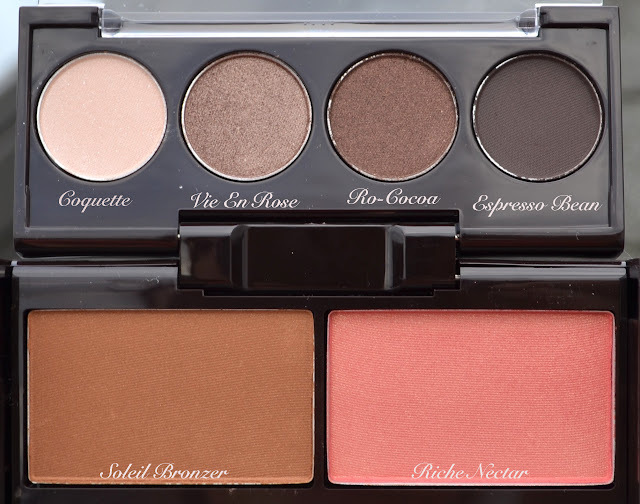 I love the eye shadows and blush shade of Laura Mercier Glam To Go Palette. Lip Gloss completes the look and combines nicely with the rest. I am yet to write a post about gift ideas for Holidays but I can definitely say that Little Indulgence Hand & Body Set makes a great one. You get four different scents of hand cream, each 30 g. Full sized ones are 50 g and I used to give those as gift for Xmas in the past years. This set is a great way to try out different scents and is less risky since you don't commit on a scent which is hard to choose for someone else. In the set the following Hand & Body Creams are available: Tarte au Citron, Almond Coconut Milk, Creme Brûlée and Ambre Vanilla. The scents are all gourmand and as a hand cream, they almost feel as good as enjoying your favorite desert. 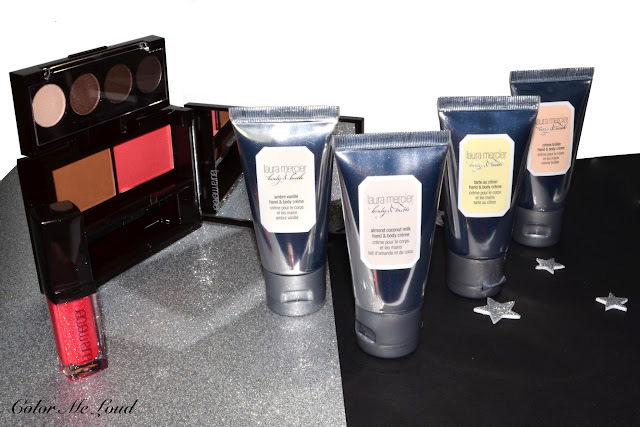 Final thoughts: Each year Laura Mercier comes up with beautiful products for holiday and this year is not an exception. I am loving the effortless chic "made to go" look with Laura Mercier Glam To Go Cheek, Eye & Lip Travel Case and the attractive gift idea presented by Little Indulgence Hand & Body Cream Set. Definitely check them out if you are on the market for a gift, for yourself or for another. Which scented hand cream is your favorite? Jedes Jahr wieder schmachte ich die Holiday Sets an. Vor allem diese kleinen kompakten Paletten. Sie sind einfach super praktisch und qualitativ super. Loving the look of this LM palette. I could do without the gloss, but the powders look stunning! Lovely look and so funny about the mascara. I sometimes forget blush and end up dabbing a bit of color from a lipstick. I like the palette. 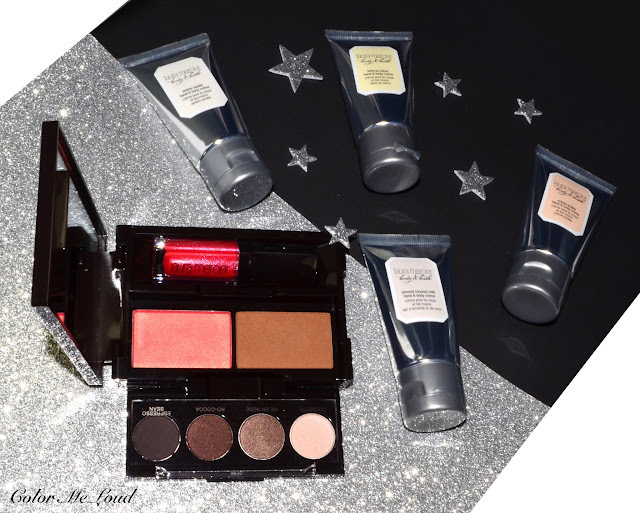 I passed on this one although I got some Laura Mercier gifts for this Chrsitmas. My favourite hand cream is the creme brûlée one, I use it every day :)! The only thing I noticed this year with LM offerings is that you get less for what you pay for at least in comparison to last year and for some products, which I did not like as an approach. I bought the eye caviars last year, five full size and this year for the same cost, they give you minis. The cheek set is lovely so are the body sets though. 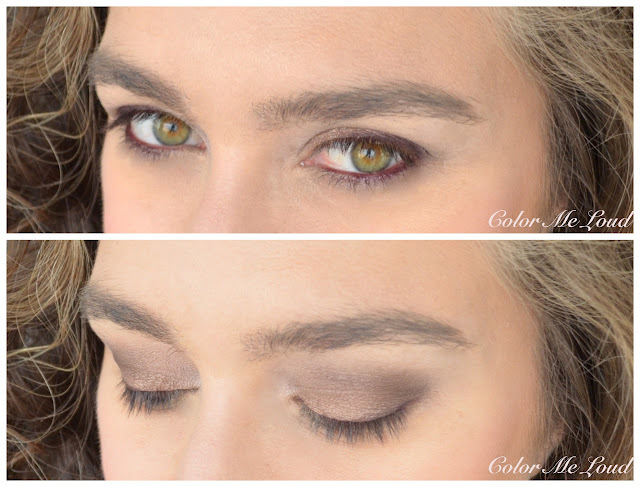 Love the look you created with the palette here though!